Oh man, I loved Fangirl so much. A crazy amount. Instant favorite. In the interest of full disclosure, I’m not 100% sure that part of that wasn’t the absolute joy of recognition. Cather (Cath) Avery, the titular fangirl, is a fan of “Simon Snow,” a blatant stand-in for Harry Potter, and I was certifiably obsessed with Harry Potter for years, including – yes – both reading and writing fanfiction. (Cath’s favorite ship, Simon/Baz, seems to represent Harry/Draco, and I was more of a Remus/Sirius girl, but still.) Rainbow Rowell has written about her experience in the Harry Potter fandom and she nails a lot of things about being in fandom and the appeal of fanfiction, how it feels to love a world so much you just want moremoremore forever. Infinite variations. Of course, everybody’s experience of fandom is different and Cath’s is not representative of all fangirls. For example, Cath is curiously shut away from the social and communal aspects of fandom – she takes her own fanfiction so seriously that she doesn’t read other people’s fanfiction in order to avoid being influenced by it too much, and that’s very, very different from the experience of most fans I know, who thrive on the conversation that takes place in the course of storytelling in such a collaborative community. However, I’ve noticed that my own real-life social anxiety is reflected in my fannish life by my tendency to lurk, and Cath’s anxiety is much worse than mine, so I didn’t regard her behavior as unrealistic or an inaccurate representation of fandom life, just a reflection of her own personality. Again, everybody’s experience of fandom is different, and I don’t think Rowell intended for Fangirl to represent fannish life in general, just the life of one fan in particular. 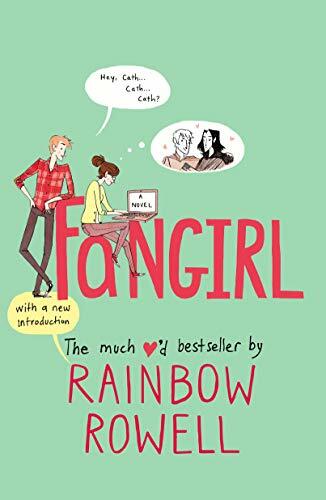 So reading Fangirl was so fun for me. These are my people, you know? On multiple fronts. It took no effort whatsoever to identify with them. On top of that, I genuinely enjoyed the romance and was grinning like a total sap by the end. Although not as intensely emotional as Eleanor & Park, you could definitely see Rowell’s fandom influences in the book’s excellent UST. I also enjoyed the positive depiction of female friendship and the great (often witty) dialogue. The only real complaint I have is that the excerpts from the Simon Snow books and Cath’s fanfiction didn’t really seem to connect in any way to Cath’s story. They were interesting, but they were just there, and I did find myself skimming them more often than not as the book progressed. I would have liked to see Cath’s coming-of-age journey as she gained more confidence and came to terms with her various family members, friends, and romantic interests reflected through the themes in her writing. As you might guess, I recommend this book especially strongly for people with experience in fandom (or who are at least sympathetic to the existence of fanfiction), and to people who like books with strong local flavor. It’s also a great choice for anyone who’s simply looking for a sweet college romance. In short, a fantastic read and one of the best novels I’ve read in years. Update: Rainbow Rowell has written a book about Simon Snow’s adventures! Carry On will be released October 6, 2015. I have social anxiety. Not terrible social anxiety, but bad enough that it’s definitely had a negative impact on my life. I also have periodic issues with depression, mostly of the chronic low-grade variety, although I’ve had a few episodes that were worse. 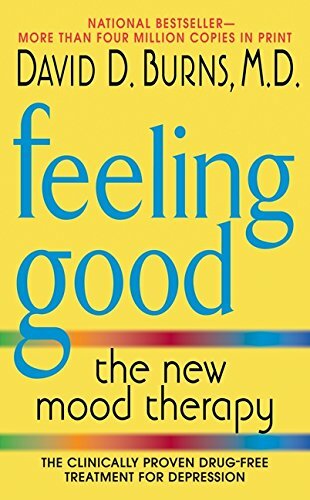 Feeling Good: The New Mood Therapy, by David Burns, was recommended to me by a psychologist friend when I asked for help after I started getting panic attacks after certain social situations, and I can honestly say it’s changed my life. Alas, it hasn’t cured me. I doubt there is a true cure, though a therapist might be able to make additional progress. But – and this is still a significant benefit and improvement in my quality of life – I haven’t had a panic attack since first reading the book in 2011, nor have I had one of my deeper depressive episodes. I still feel awkward in many social situations, but I’ve caught myself being braver, and less avoidant of them, and I beat myself up less afterwards for perceived mistakes. Again, not cured, but noticeably better. Burns is one of the developers of Cognitive Behavioral Therapy, a form of psychotherapy that’s well supported by clinical trials for its effectiveness in treating, anxiety disorders, depression, and a number of other conditions. As someone with an internal voice that tends to be self-deprecating and sarcastic at best and cruel and unreasonable at worst, I found the concept of cognitive distortions especially helpful as a kind of mental structure to help me recognize when I was undermining good feelings and exaggerating mistakes. Even simply being able to recognize and label negative thought patterns has been really helpful in reducing both their frequency and their effect on my mental state. I re-read it periodically as a sort of inoculation against trouble. If you suffer from anxiety or depression like me, I highly recommend it. It may not be an adequate substitute for seeing a therapist in person, but it’s a big step in the right direction if you need help. If you’ve stumbled on this review and you need urgent help, skip the book and call 911 or the National Suicide Prevention Hotline at 1 (800) 273-8255. If you’re not in the US, check out this list of international suicide prevention hotlines.